GRAFHAM WATER has lived in the shadow of Rutland for far too long. The last four years have seen significant changes in both waters and I now believe that Grafham has emerged as the premier Midlands reservoir. Hard-fighting, full-tailed rainbows in the 21⁄2 -5lb range are common place. The reason for this is because bank angling at Grafham is more challenging than at other Anglian Water venues as the fish often move out of reach into the deeper water. There are also significantly fewer competitions held at Grafham, giving the fish more opportunity to grow on. The diet of the fish is also a factor, Daphnia is prolific and the fish gorge themselves on this high protein food, quickly putting on weight and gaining condition. Many of the banks at Grafham have eroded over the years making it increasingly difficult for the bank angler to gain access to deep water when the reservoir is full. Therefore the best times tend to be early mornings or evenings when the fish move into shallow water to feed. Once the sun gets up, the fish leave the shallows and drop back into the deeper water to feed on daphnia (except at the backend). In periods of prolonged hot weather, the ability to cast a long line or use a shooting head is a distinct advantage as it allows you to reach deeper water. In such conditions there are only a handful of bank spots that will consistently produce - the jetty at Marlow, the Dam, the Seat and the Stones in front of the lodge. They all have one thing in common - access to deep water. My best advice for the bank fishing visitor is to fish deep water, avoid coloured water or areas that have an algal bloom. WIND dramatically affects the bank areas at Grafham Water. Strong winds quickly colour the water and move the fish out of range of the bank angler. Westerly or Southerly winds are best as they usually bring warmer weather. But strong cold North Easterly winds can make the whole reservoir switch off. In these instances it’s best to find some shelter and head for Hill Farm or Pig Bay. Follow Rob Edmund's key to the best bank areas at Grafham by clicking the map button above. The buoys are indicated from A to W.
A noted hotspot for grown-on fish, Savages enjoys prolific weed growth from the end of May providing a perfect habitat for fry, snails and buzzers. Westerly winds blow food over the deeper water and the fish follow the food trail upwind, arriving at Savage’s Creek. Once fish become established (usually around the end of June) they rarely leave until the weed dies back at the end of season. Unfortunately access is difficult from the bank, as a long walk is necessary from the car park at Hill Farm. So it pays to travel light. A floating line with Hare’s Ears, Diawl Bach or a red dry is among most peoples preferred line of attack, but don’t forget the Minkie. Top tip: Use a long-handled landing net to reach fish over the weedbeds when netting. Best times: July- Oct (July Bank open only from July 15 to Oct 31). Wading: Not permitted , except along into Sanctuary Bay and Rainbow Point. Can be essential if you’re going to fish over the weed beds. Wind effect: Best in a Westerly. The stumps can be on unpredictable area for much of the season. At certain times fishing can be excellent; at other times downright impossible. Although the opening week of the season offers consistent sport, it’s an area to try for half an hour, then move on. Stock fish can run down the bank from Hill Farm and are easily caught if they are there. If you intend to walk to Savages, it’s worth stopping off at The Stumps on the way. But be aware that there is just one stump left in the water. A floater or intermediate are all that’s required as the water is only around 12 feet deep. A goldhead Damsel with two Buzzers on the droppers is my favoured line of attack. Top tip: Keep moving until you find the fish. Best times: Unpredictable, so any time can be good. Fish are stocked at Hill Farm and either run up the bank to Hedge End, or out into the open water by the Tower and Stumps. To the left there is a small outcrop of rocks, just off the point, that juts out around 15 yards. This gives the bank angler access to deep water right at his feet and produces fish in any wind. A light North-westerly wind is perfect. However, once the sun gets up the fish tend to drop down into the deeper water. To reach the area, drive into the village of Grafham, turn down Church Road and continue past the Caravan Park on the right. An area of the bank that’s underfished, again due to the walk that’s required. It’s best to park at Hill Farm, stopping off first at the stones on the point, before making the long walk to Hedge End. So once again, travel light. A floater or intermediate line is all that’s required. A South-easterly wind allows you to wade off the point and cast towards the tower at Hill Farm, and reach the deep water. Last year from November until the end of December, some fantastic winter sport with fish averaging 3lb was to be had all along the North shore, with Hedge End being the most prolific mark. Early-season stock fish tend to hold off and around the point, giving the bank angler consistent sport until around June or July when they move out into deeper water. Top tips: Try Tadpoles on a intermediate line. If you prefer a peaceful day not standing shoulder to shoulder with other bank anglers at G buoy, or struggling with the uncomfortable slant of the dam, it’s worth spending an hour or so at Deep Water Point. A light Northerly or Westerly wind will allow you to get maximum distance and usually produces the most fish. As with Hedge End, underwater currents concentrate food across the point. An excellent spot for the first three months of the season when the fish have not yet moved into deeper water. To get there, turn into the village of Grafham, and go left down down Church Road by house numbers 1, 3 and 5. Follow the single track for a quarter of a mile to Deep Water Point. Top tips: If you fail to catch within an hour, move. Probably the most famous mark on Grafham Water, as it fishes consistently well all season from both bank and boat. The point directly in front of G Buoy tends to be the hotspot as the currents channel food across it in a North -westerly wind. As with many marks on Grafham, as soon as we experience a prolonged period of hot weather the fish move into deeper water around 60-70 yards out, well out of range of the bank angler. Top tips: Go for distance and reach the deeper water. Wind effect: Good in all winds, so long as you are able to cast adequately. Access is easy with the jetty only a short walk from Marlow Car Park. This is a spot that will almost guarantee you a fish from the bank. The jetty allows access to deep water at your feet if you fish off the point. But care must be taken not to slip on the stones when netting fish. Fish tend to hold off the point and in the bay to the right. Top tips: Fishing “the bung” can produce excellent results in light winds in summer months. Wind effect: Good in all winds. Once past the willows, the first 50 metres of the north end of the dam starts to shallow. It’s far better to start fishing 100 metres down and steadily walk down the dam to reach the Bowl and the Tower. The hotspot tends to be around the yellow casting sign easily visible on the Dam wall. The Tower is the deepest part of the Dam and fry tend to hold around the concrete posts, attracting large trout and the occasional zander. I have had considerable success by fishing a large Cat’s Whisker Booby on the point, with a Bloodworm on the dropper, on just a seven-foot leader on a fast sinking line. On some days you can catch a mixed bag of trout, perch and pike. The first stretch of dam at the Gaynes Cove end of the dam is shallow as silt has built up over the years, and this area can offer some excellent buzzer sport in May and June. Further along towards the Tower the bank angler has access to deeper water, and the opportunity to catch fish when the hot weather arrives. The key is to find the correct depth at which the fish are feeding. Boobies on a short leader and a fast sinking line can be effective in hot spells with orange my favourite colour. A Westerly wind can create an undertow and hold the daphnia and fish around 15 yards off the dam, ideal for the bank angler. Wading: Dangerous. Care needed not to slip on algae on the stones. Wind effect: Best in light Westerly or Southerly. 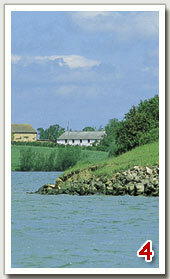 Gaynes Cove provides shelter for the bank angler in most winds, and is affected only by a strong Northerly. With a depth of around 12-16 ft, it’s an ideal spot for fishing nymphs such as the Cruncher, Diawl Bach, Bloodworm and Buzzers. 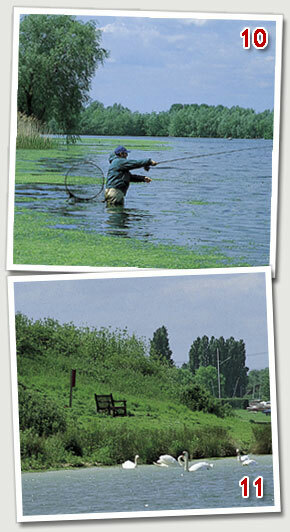 Bank fishing can become limited in summer months as weed growth is rapid from May onwards. This does, however, provide shelter for pin fry, snails and corixa present from June onwards which make up a large part of a trout’s diet. If the wind has been light or moderate, and blowing into the bay for a few days, daphnia can be pushed in and the fish follow. Some excellent sport can be had with a Cat’s Whisker and Blobs on intermediate lines. Top tips: Can be excellent in summer evenings. Best times: All year, especially April-July. My favourite bank fishing area, with just enough room for two or three anglers. The hotspot is directly in front of the Seat, where you can wade out on a relatively shallow point and cast towards the Sailing Club or the Tower on the dam to reach the deeper water, dependent on the wind direction. Some fantastic sport was to be had here last year on Hare’s Ears fished almost static on a floating line when the fish were feeding heavily on snails. Access to the Seat has been considerably improved with the development of Wyndham’s Way, a tribute to the late Wyndham Davies of GWFFA, which is signposted from the Plummer car park. To the left, the Sailing Club holds some very large fish that are attracted to the buoy’s pontoons. Top tip: Static Hare’s Ears on a floater, just sub surface, in summer months. Wind effect: Best in South-westerly. The harbour and the Stones can hold vast shoals of fry (although not so prolific last season) while the deep water offers sanctuary for the fry feeders that are often present at the backend. It was here that Dave Barker caught the record Grafham rainbow of 13lb 3oz on a Minkie. Fish are also stocked here throughout the year to provide sport for the beginners’ courses, so if you’re struggling and wish to get a couple of fish for the pot, it’s an ideal spot. There’s also the chance to get a larger bonus fish. Large Minkies or the Humungus have always provided me with plenty of action, usually fished on a fast glass line or Di-3.